A ticket for Prague public transport permits travel on the metro, all trams and buses, and you are able to transfer between these means of transport, within the time limit of the ticket. You can purchase your ticket at metro stations, newsagents and Public Transport Information Centers, located at Prague Airport, and at Muzeum (lines A & C) and Mustek (lines A & B) metro stations. Depending on the length of your stay in Prague, you might consider buying 1-Day, 3-Day or 1-Month pass instead of standard single tickets. These tickets permit travel on any mode of public transport at any time of the day and night. A single ticket (90 minutes of travel) will cost you 32 CZK, reduced price for children aged 10-15 is 18 CZK. A short term single ticket (30 minutes of travel) is 24 CZK, 12 CZK for children aged 10-15. A 1-Day pass (24 hours) costs 110 CZK, 55 CZK for children. A 3-Day pass is for 310 CZK for both children and adults, a monthly pass is 670 CZK, also for both adults and children. Make sure to validate your ticket by punching it in the orange machine located at the top of the escalators on the metro, and inside trams and buses. 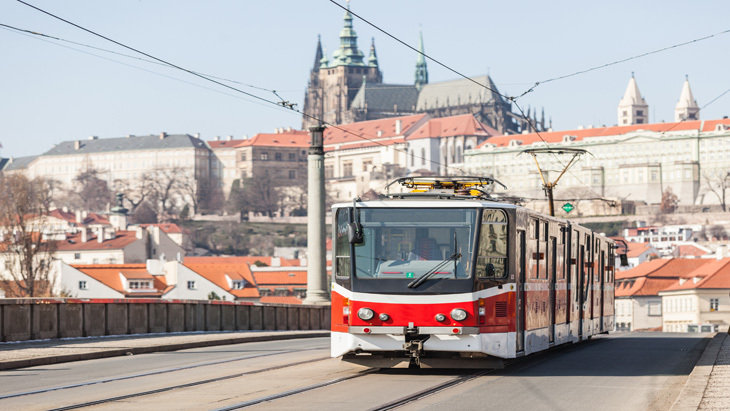 Make sure you always have a valid ticket because inspectors (checkers) in Prague are entitled and fairly often control validity of tickets and imposed fines for travel without or with an invalid ticket. Fines are big and by far exceed the cost of the ticket or the pass.